zunka or jhunka is a rustic, Maharashtrian delicacy made of bengal gram flour or besan. My sister-in-law made this once, and I got hooked to it forever. It has a sunny yellow colour, a delicate aroma that entices your senses even before you have taken your first bite. Try it – I bet you won’t regret. If you visit Thane you must havt this at Tambe’s on Station Road, Thane (W). They makes it spicy and soft. I was introduced to Tambe’s zunka by Neela, a close friend of mine, who is prefers to order food from the canteen rather than bring home cooked lunch. She often buys this dish. Another friend, Asha makes a ‘mau’ (soft) version, and she adds roasted and powdered peanuts to the recipe – it works wonders but I don’t add it myself. I love the plain unadorned rustic version. Ajwain / Aniseeds – 1tsp. Jeera / Cumin seeds – 1/2 tsp. Coriander leaves – 2 to 3 sprigs. Oil – 2 to 3 tbsp. Roast the besan till aroma is released and set aside. Heat oil in a deep wok / kadhai. Add ajwain and jeera (To ensure that it doesn’t become gassy – we wouldn’t like that!!). Add onions. Add a little salt, turmeric and chilli powder. Mix. Cover till the onion turn soft. Add besan, parsley/oregano and sprinkle water all over roughly. Mix. Again sprinkle water about 1/4 cup all over. Mix till the besan gathers into soft crumbs. Adjust salt. Mix again. It will be a little sticky. Cook stirring, cutting and mixing with a wooden spatula all the while. The mixture will become soft, lumpy and will crumble upon touch. Top with chopped coriander leaves and green chillies and serve it with flatbreads of any kind – bhakri (Made with rice or bhajni), or roti. 1. My friend Asha, crushes roasted peanuts and adds it in the beginning after the onions. 3. Tambe’s grind green chillies and garlic and add the mixture before the onions. They also crackle mustard seeds instead of ajwain or jeera. 4. I use oregano, parsley or kasuri methi as they agree with besan. All the versions taste good irrespective of the additions or deletions. Made this yesterday for dinner and needless to say there were no leftovers. 🙂 Made it with Kasuri methi. Question: Do you use fresh oregano or dry; also doesn’t oregano taste similar to ajwain? I use dried oregano while making this, about 1/4 to 1/2 tsp. these days as opposed to 1 tsp as mentioned in the recipe. Yes, oregano has a similar underlying flavour profile, a little mild perhaps. 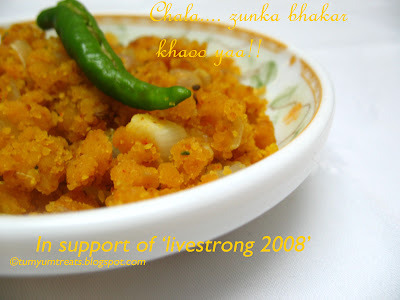 just checked your blogs and found this recipe of ‘jhunka’. one of my favorites and when served with ‘bhakri’ it is the best meal on the planet! !